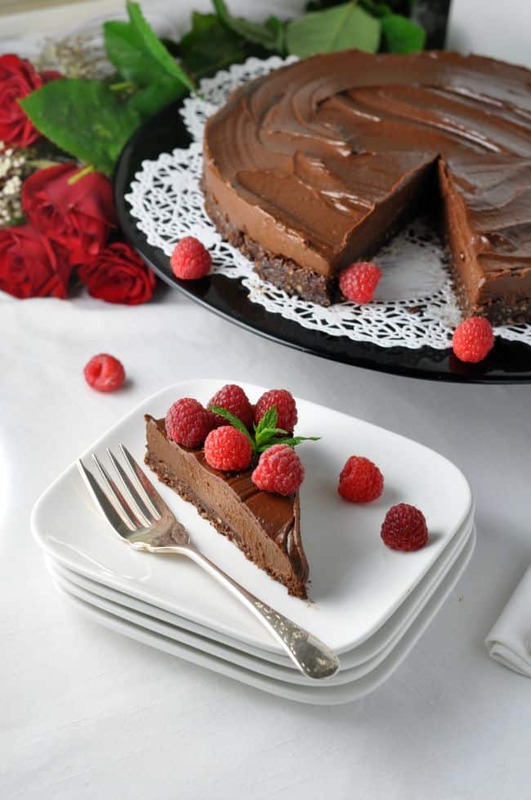 This vegan no-bake Double Chocolate Mousse Torte is a simple but simply fabulous recipe. 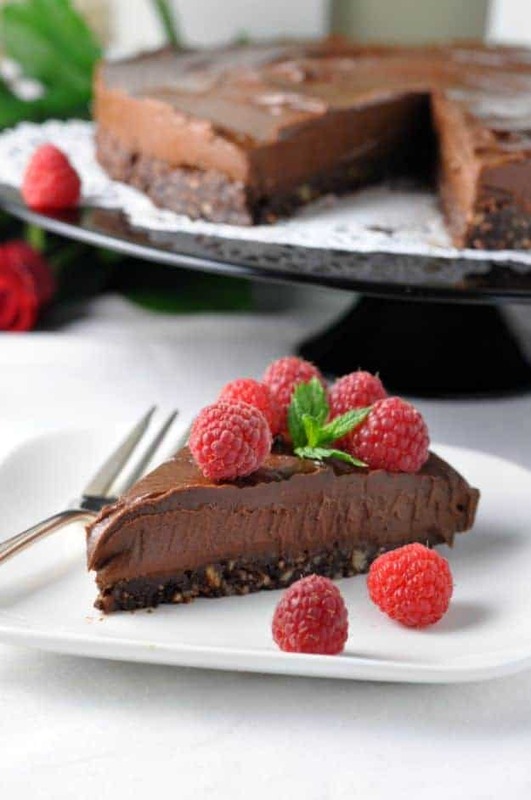 It’s dairy-free, gluten-free, decadent and delicious! It’s my birthday! 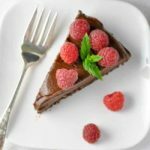 Could there be a better way to celebrate a summer birthday than with this no-bake Chocolate Mousse Torte from Oh She Glows? I think not. Chocolate. Pecans. Naturally sweetened with maple syrup. Dairy-free and gluten-free. Everything I could ever want for my birthday! It’s rich, silky smooth filling tops a nutty, slightly crunchy crust and the combination is divine. This no-bake chocolate mousse is about as close to a high-fat whipping cream mousse as you could get without indulging in all that delicious nonsense. I was a little dubious the first time I tried a chocolate mousse recipe made with avocado, but I had no need to be worried. The avocado gives this mousse a silky texture with no avocado flavour. Using a food processor makes this a quick and easy recipe. I lined the bottom of my springform pan with parchment paper and the torte was easy to remove from the pan and slide on to the serving plate. Yay! No kitchen disasters with this one! I’m filing this recipe away for a winter holiday menu too. 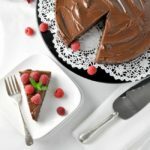 So celebrate (virtually) with me by making this easy and simply delicious Double Chocolate Mousse Torte and thank Angela Liddon of Oh She Glows for her fabulous recipe! 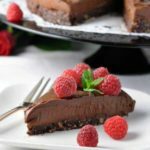 An easy but simply fabulous no-bake vegan Chocolate Mousse Torte made with avocados and sweetened with maple syrup. Oil the sides of an 8-inch springform pan and line the bottom with a circle of parchment paper. Pulse the pecans in a food processor until crumbly. Add the remaining crust ingredients and pulse just until combined. Mixture should be crumbly. Wet your fingers or use a spatula to press the nut mixture evenly into the bottom of the prepared pan. 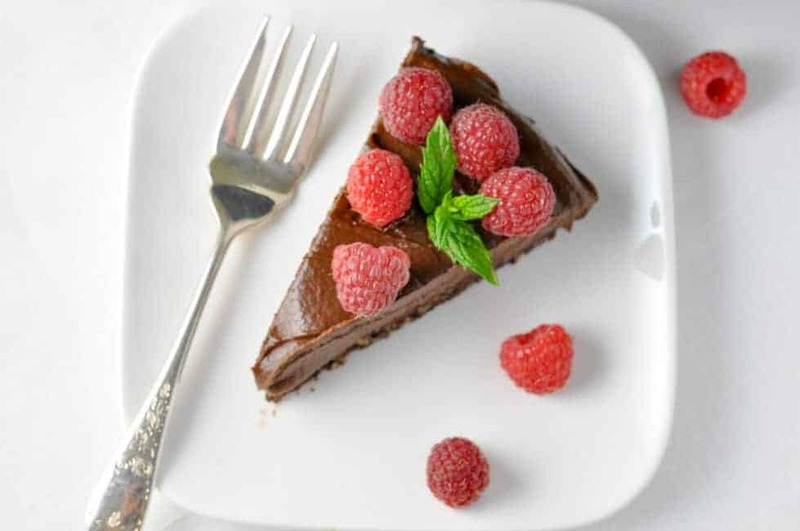 Place in the freezer to set while you prepare the Chocolate Avocado Mousse filling. Peel the avocados, remove the seeds and scoop out the flesh. Place all mousse ingredients except the chocolate chips in a clean food processor and process until smooth. Melt the chocolate chips, add to the food processor bowl and blend until smooth. Remove the crust from the freezer, scoop the mousse filling on top and smooth it to the edges of the pan. Return to freezer for 2 hours to set. When thoroughly chilled and set, remove from freezer and let it sit for 5 to 10 minutes before serving chilled. Top with fresh berries, if desired. 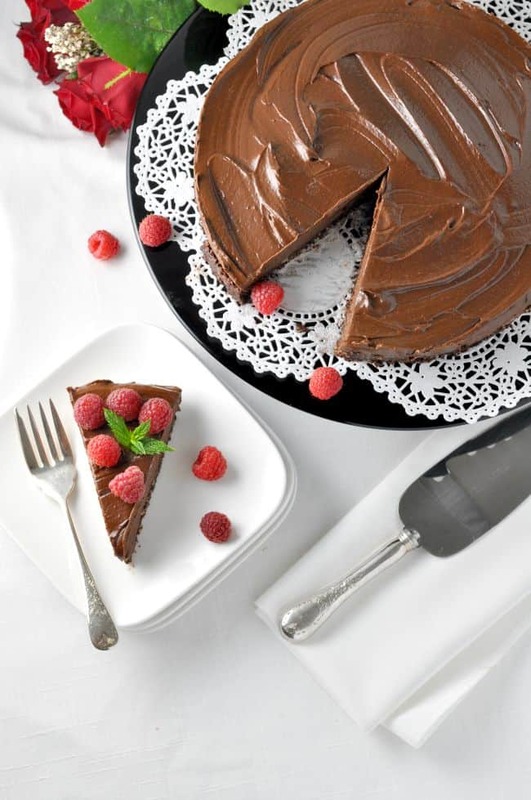 The torte will soften at room temperature, so wrap any leftovers tightly and return to freezer. You can find Oh She Glows original recipe Chilled Double Chocolate Torte: The No-Bake Version here. I have adapted her recipe only slightly. The recipe called for 2/3 cup maple syrup in the mousse but I substituted 1 ripe banana for 1/3 cup of the syrup as I thought it might make it a little more firm and hold its shape. I also substituted tapioca starch for the arrowroot as I happened to have it on hand. 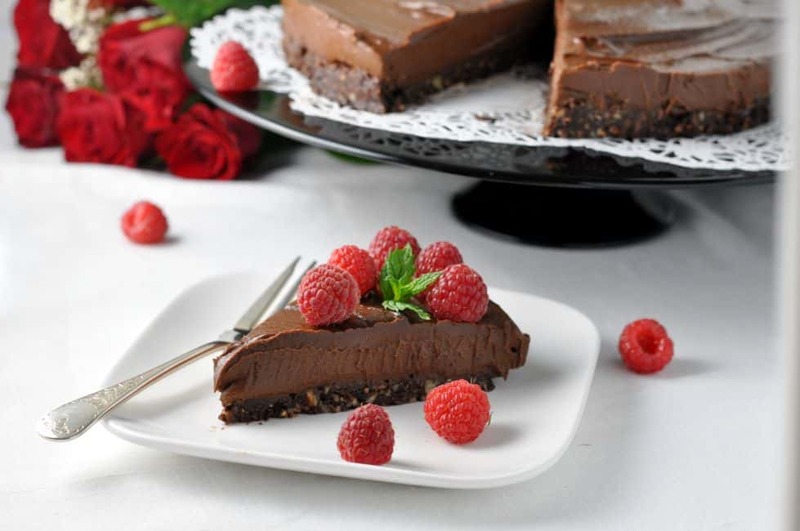 The resulting torte filling is similar to the my recipe for Dairy-Free Chocolate Mousse. I can only imagine how delicious this torte must have tasted! The filling looks so smooth and velvety and I bet compliments the nutty crunchy base perfectly. Yum. Thanks Thalia! We had the left over slices for dessert tonight with some fresh raspberries from the garden. It freezes beautifully. OMG I’ve been wanting to make a chocolate mousse for so long. Love the idea of adding avocado. I try to use it as much as I can in my baking too, it’s definitely a healthier fat! Hi Taylor, This one won’t disappoint!